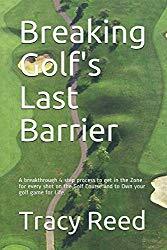 While you are waiting patiently (thank you) for Breaking Golf’s Last Barrier to be completed, There are a few books I have read that are related to many of the concepts I use in my teachings. I put them on my suggested reading list because these are books that will help you in golf and other areas of your life. I don’t often recommend books, but these are some of the best I’ve read lately. So here are three that I think you will like. The first you may have seen on the Golf Swing Control website. This book explains what Myelination is and why it is important for anyone trying to learn a skill. Daniel Code gives real life examples of how certain teachers around the world have used methods that promote myelination and have turned out years of world class athletes, musicians and the like. The second book is one I mention in Breaking Golf’s Last Barrier. I talk about the importance of nasal breathing for your health, focus, mental clarity, and most importantly how nasal breathing is one of the factors that will help you find the Zone on the golf course. Before I read this book, I had no idea that something so simple could do so much until I made a concerted effort to follow the program. My life is now so much calmer. The last book I am suggesting is also important to anyone striving to attain any kind of goal. This book explains the truth behind how those who make it to the top get there. There is no quantum leap as most people think. Anyone can do it if you follow Jeff Olson’s advice. Much of my research about how to succeed with your golf game is outside of the golf world. These three book are good examples. The will help your golf game, but they will also make a difference in other areas of your life. http://www.golfswingcontrol.com You may need to sign up and create a new account as this website is newer. I would be most interested in your thoughts on mindfulness. My teaching starts with awareness of balance during movement. Mentally, I also teach awareness of conscious thought and subconscious visualization. The body follows the adjustments made as a result of your awareness I would say that if there were a “Mindful Golf” instruction program, it would look exactly like mine. As long as you remain on the green side of the grass, you are NOT beyond hope as long as you are enjoying golf.